Since starting my night shift job almost seven months ago, Hubby and I have found it nearly impossible to go to church on Sunday morning. We’ve made a few valiant attempts to set the alarm for 9am so that we can get cleaned up, eat breakfast, and make it for the last service at 11am, but inevitably we would sleep through the alarm. When you rarely turn in before 4am and walked the equivalent of a few miles over the course of your work night, getting up just five hours later is a difficult feat! A few times, we’ve gone to our church’s Sunday night multicultural service, but it simply isn’t the same. 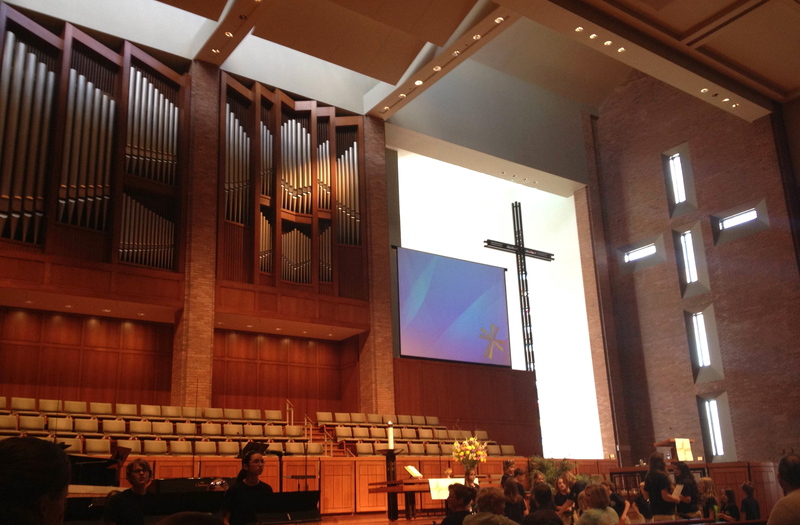 We love the hymns and the swelling choir – things not offered during an evening service. Last night, however, we planned ahead. We were in bed by 1am, and although I overslept until 9:30 and we ran around, clothes and shower towels everywhere, we made it into the church parking lot with 9 minutes to spare! And boy, oh boy, am I glad we did. I’ve missed our church. I’ve discussed my faith journey in a previous post and since I made that entry three months ago, my heart has changed a bit (which I will get into in a minute.) Our church is a very unique one in the world of the United Methodist Church. It’s special. It’s beyond unique. And I’m not just saying that because I love the place so much. Stepping inside our sanctuary is always awe-inspiring. Every time. And our pastor. Lord Almighty, our pastor is truly gifted. Our hearts broke when our long-time pastor retired nearly two years ago now, but we were blessed with the amazingly talented Rev. Rob from North Carolina. Rarely do his sermons leave a dry eye and today was no different. I felt moved and recharged at the end of his sermon, where he preached about how special we are to God and how much we mean to Him. As we filed out of the massive sanctuary and headed back to our car, Hubby said, “That was good. That was really good.” And it was. On our drive home, we both lamented about how exhausted we were and promised to one another that we needed to make time for worship each Sunday. I retold an incident at work where one of my associates was talking about going to church and I asked her how she managed to be at church on a Sunday morning when she worked night shift. Her response? “Honey, that’s just the devil stoppin’ you! You gotta get up, tell the devil to stuff it, and go! You can sleep later!” I think she had a point. Now, regarding my “change of heart.” I went to Mass a few weeks ago. First time in over three years. I told myself that I’d just go once but find that I’ll probably go more than just that one time. After all, the local Catholic parish is within walking distance from here. You see, I’m at a weird point in my Walk – I’m happiest in the UMC but part of my heart still aches for the Roman Catholic Church. I wasn’t raised Catholic, but I spent 18 months in RCIA, was baptized into the church in 2007, and walked away in 2010 due to my frustrations with the the Church’s obsessive focus on anti-abortion at the expense of everything else in spiritual life. In January, something happened to my family that tested both my faith and my sanity. In hindsight, I overreacted to a bad situation, but try telling that to someone with Generalized Anxiety Disorder when they’re in panic mode. (Hint: they won’t hear you.) Ever since then, I’ve prayed the Chaplet of Divine Mercy pretty regularly. And I started listening to old episodes of Mother Angelica Live again. (How I love that nun!) My iPhone is full of religious apps, most of them relating to saints, Mary, and the liturgical year. Where is this all coming from? I ask myself this daily yet I don’t have an answer. I’m not ready to commit fully back to the RCC. I’m not willing to give up the beautiful spiritual life I’ve found (again) through the UMC. I want to go to Mass on Saturday night and Worship on Sunday morning. And something occurred to me recently because I realized that I can do both. See, I’ve spent the majority of my life believing that things were either black or white, right or wrong, up or down. Life, though, has thrown all kinds of lessons at me through an African American husband, a lesbian best friend, bigoted relatives, and a family torn apart by addiction. I am happy to finally say that I don’t have to be ONE type of Christian. It’s nobody’s business but my own if I choose to worship in both the United Methodist and Roman Catholic churches. If I feel spiritually complete, that’s good enough for me. I can’t fit myself into this tiny little square Methodist hole, because then I’d be denying those parts of myself that want to pray the rosary and read about Marian apparitions. And I can’t shove myself into that little round Catholic peg, because then I’d lose the amazing inspiration and outreach that I find as a Methodist. I’m a round peg AND a square hole. And you know what? They fit together just fine.